First Baptist Church in Quincy, FL was among the churches in the path of destruction left by Hurricane Michael last year and while in the midst of an overwhelming amount of damage, they found encouragement and tangible help from the Florida Baptist Convention (FBC) thanks to Cooperative Program giving by Florida Baptists like you. Thanks to Cooperative Program giving by Florida Baptists through their local churches, over 500,000 meals were prepared and served, more than 600 clean-up and recovery jobs were completed and more than $1.4 million was put into church accounts to help them meet insurance deductibles and repair their buildings and serve their communities. Cooperative Program dollars also plant and revitalize churches across Florida by starting a regional ministry to local churches and pastors, providing funds for multicultural church ministries, focusing on next generation from birth to college and funding compassionate ministries to undergird Florida churches. But your reach goes beyond Florida. Florida Baptists are also supporting missions across the world by sending 51 percent of CP funds to the Southern Baptist Convention. Last year Florida Baptists gave over $7 million to the International Mission Board to reach the nations by funding missionary families and $3.48 million to the North American Mission Board to plant churches. 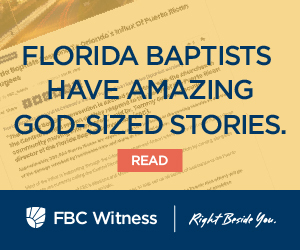 When you give, you are a catalyst to change, sparking a momentum that has been growing with Florida Baptists and the SBC to change hearts in the state and the nations. “When you give to your church, you reach Florida, North America and the World,” said FBC Executive Director-Treasurer Tommy Green. This Cooperative Program Sunday April 7th, encourage your church to be a catalyst for change using multi-language resources available here. Remember, the Spark begins with YOU.